When I started this blog it was right before Adaline’s first birthday party. I thought that it would be nice to start a blog about our family and all of the fun we have together and traditions we start and all that jazz. So I did. The post about Adaline’s party was just about the only thing getting traffic on the blog and I thought that people might be interested in seeing her nursery. My line of thinking was if people like looking at cute girly birthday parties they’d probably enjoy looking at cute girly nurseries too. Thus I prepared a post about Adaline’s nursery. I’ve been reading Smockity Frocks and Raising Olives since the beginning of the year and I saw that the 4 Moms were going to be showcasing bedrooms and asking readers to link up. So I thought since I was going to be posting about Adaline’s nursery anyway…why not add my link. I did. And while it might not seem like a lot of traffic to the veteran bloggers that may be reading…it was like a blizzard of hits for me. All of this to say that this week the 4 Moms are featuring bedrooms again…so you’ll be seeing the less-than-exciting “master” bedroom this week. Ok, so since I already rambled on about a bunch of nothing and I sometimes tend to give too many details like here and here, I’m going to try to give you the abridged description of the room. It’s not very big & there’s not too much going on in it, so it shouldn’t be too hard (yet look at all of those words down there, hmmm). I’ve put a lot of little descriptions right on the photos themselves and you may have to enlarge the photos to read the smaller print. We have a big ‘ole king sized bed. This is necessary because I have a big ‘ole tall husband who does not fit on a human-sized bed. This suits me just fine as I love the big bed! You’ll see nice (and wrinkled!) Croscill bedding that I got over 50% off. We never use it. It’s too heavy to sleep under and there’s no way it’ll fit in the washing machine. It just stays folded up on a trunk. We use a quilt from Wal-mart on the bed everyday. If there is such an occasion where we put on the “good” bedding (like maybe we’re going to show pictures of our bedroom to a bunch of strangers on the internet), we just put it right over top of the quilt. Our furbaby, Muppet, sleeps in our bed so he has a set of doggie steps on the one side of the bed. He also has a cage in our room where he can hide from me when I need to clean his ears or he wants to eat a tissue he isn’t allowed to have. On top of the cage we keep a basket of toys for him, but he never plays with them (probably because he can’t reach that high!). Next to his cage is a basket of various shorts and lounge pants of mine. When Adaline was first born and I was still nursing I kept my nursing gowns and pajamas in the basket. I often had to do a quick change. I continued this practice during her spitting up phase. More quick changes were necessary. Now I can usually make it through the day without having to change any clothes, but I find the basket of comfy pants convenient…so there they stay. The bedroom suit is from Value City Furniture and I had it before we were married. In these photos you’ll see one dresser and a lingerie chest, but there are two other dressers in the set that won’t fit in the room. We keep one of the dressers in the closet (the closet mentioned and pictured as #3 on The Giant To Do List), and another in the spare bedroom. The dresser with the mirror that you see in the photos was the reason why I bought the set. I loved how it curved in the front and had flowers carved into the sides. However, curvy drawers are not great for fitting a bunch of clothes in I’ll have you know. The little décor that there is in the room was all stuff that I had before we were married. Almost all of the pictures are of hummingbirds and most everything was purchased through Home Interior or at Kirkland’s. junk on the dresser tops, the armoire is open exposing more junk, there is junk sitting on the floor in front of the armoire, the curtains are slung over the armoire and dresser so that we can feel the air conditioner (a normal person would probably just get some tie-backs), my husband has pants piled on top of the dog’s toys, various tote bags containing more junk are hanging on the closet door by the bed, magazines and books are piled on top of each other rather than being lined up on the book shelf, the cheap quilt is on the bed, the tv pillow is on the bed, the “good” bedding is piled up on the trunk. And that’s probably about it. Thanks for stopping by and looking at my boring room. Posted on September 2, 2010, in Open House and tagged open house, photos. Bookmark the permalink. 3 Comments. I think your bedroom looks like a place to relax! Exactly what it’s purpose it! I love the curvy dresser! 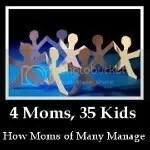 hey, so i’m a bit late – i just found the 4 Moms, and all – and i’ve been poking around your website for a while. you’re funny! those pictures [this is a lamp… for lighting dark spaces. this is a clock… for telling time. !!! and LOL] funny is good for me! and you have a beautiful home [no REALLY! you do!] and your messy is cleaner than mine, and i don’t have the excuse of child[lings] but i do have excuse of disability, i guess, it’s not DIRTY, just… messy. cluttered. drives me nut, and prevents me from using the wheelchair in the apartment. anyway, blame the babble on the meds – and you’ll see me again!